I love a good holiday tradition no matter what that holiday may be. When I got married I looked forward to the time where I would have kids to start my own family traditions as my own mother did with us. My two toddlers are now at the age where they understand what the holidays are about for the most part and can really get more involved in making family traditions. Halloween is one of those holidays we really like to go all out. I swear the entire month of October, we are doing something to celebrate the upcoming trick or treat festivities. We baking pumpkin cupcakes, we visit pumpkin patches to pick our own pumpkins, we go shopping for coordinating costumes, we challenge ourselves (mostly mommy) to carve the most difficult, favorite cartoon characters the kids can think of, roast pumpkin seeds, decorate the house and it all comes down to the last day where we finally trick or treat. Our pumpkin carving day is probably the biggest tradition of them all. After we have stomped through the pumpkin fields at a nearby farm and picked the perfect pumpkin we get them home to carve. The kids love gutting out the pumpkins and washing them to make Roasted Pumpkin Seeds to eat later. I get to work tracing and carving the pumpkins while the seeds bake and then we all settle down to watch a nice Halloween movie and eat our pumpkin seeds together. Each year, it seems like a bigger deal to them and they get more into the festivities with me as they get older. I absolutely love celebrating Halloween with them. This year we even adorned these gorgeous Halloween t-shirts from Zazzle while we celebrated carving day. 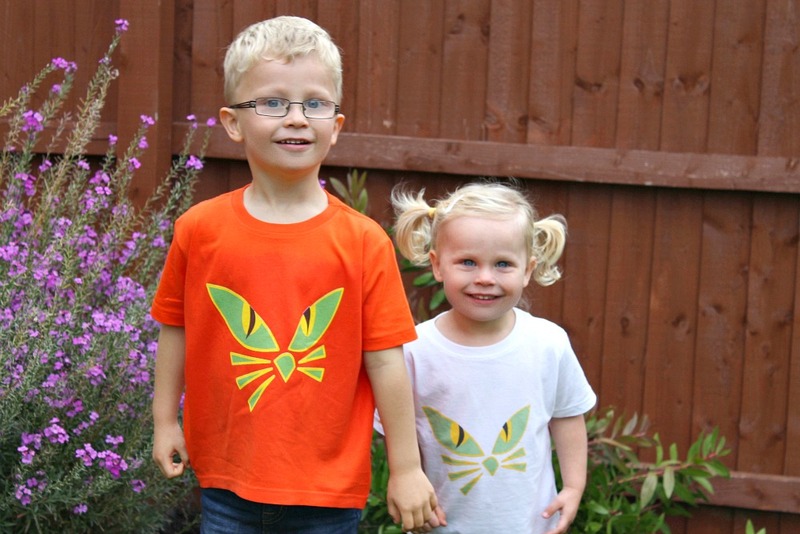 The kids looked absolutely adorable in their his and her style of the same t-shirt. Zazzle have hundreds of Halloween styles, designs and patterns to choose from. I think, I will be adding our Halloween t-shirt wearing on this special carving day to our Halloween family tradition. It’s like novelty Christmas sweaters for Halloween. What a great idea. 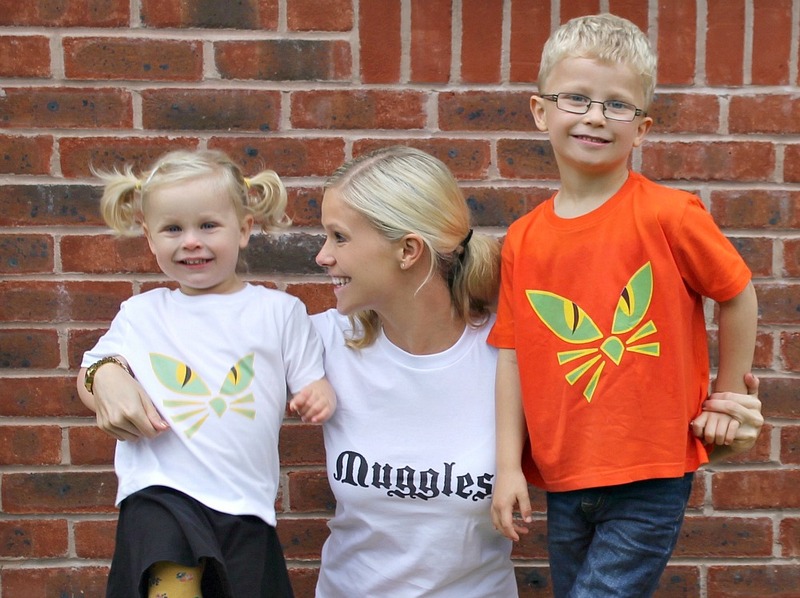 I am a huge kid at heart and a secret huge fan of Harry Potter so my “Muggles” t-shirt was a perfect fit for me. I even wore it the other day with a nice black blazer and heels and got a lot of compliments on it. I hope that my kids grow up and have fond memories of our holidays together and pass some of these traditions down to their own children as I have done. 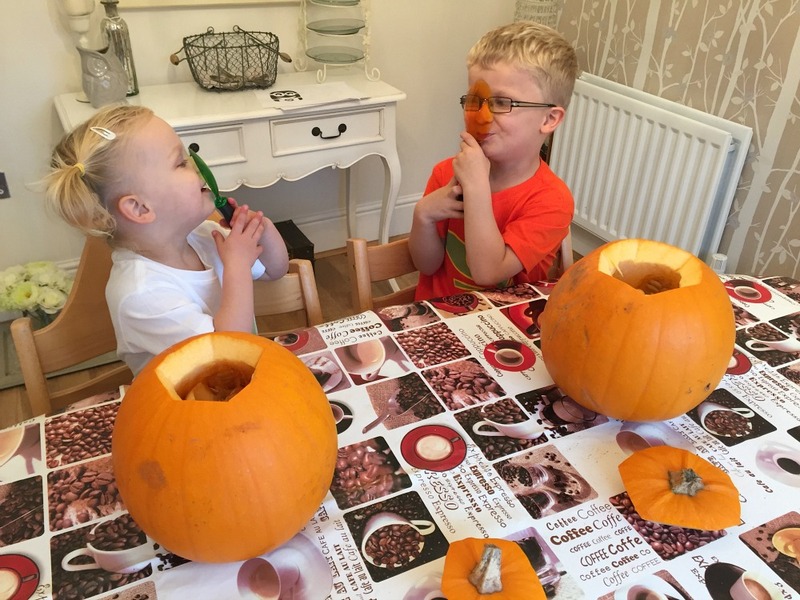 It’s a great excuse to get creative and have family days out at the pumpkin patch or messy play in the pumpkin seeds before you roast them for a delicious snack. Kids love doing something a little bit different and even my two loved dressing up for the part. They haven’t taken their Halloween t-shirts off all week. It really made the carving day feel like Halloween. The longer you can stretch out each holiday, I say the more fun you will have together as a family. It’s fun to celebrate things together. Do you have a Halloween family tradition? Is there anything specific you look forward to doing with your kids each holiday as it comes around in preparation? I would love to hear your stories, comment below. 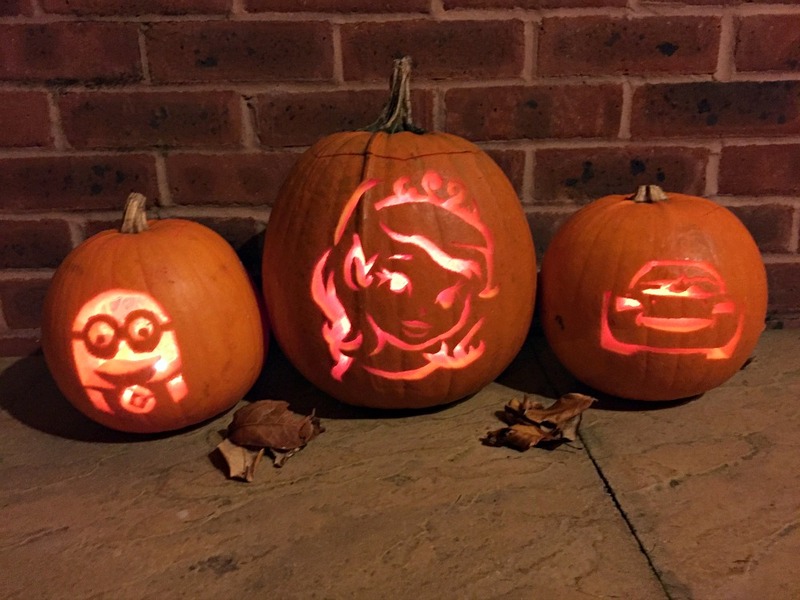 This Halloween the kids have asked me to carve them Lighting McQueen and Sofia the First pumpkins and well, I had to throw a famous Minion in there for myself. I love carving pumpkins, no matter how challenging the face is. I think I even got a little competitive when I was growing up with it. Last year, I carved Olaf and Doc McStuffins and the kids squealed with delight. Check out how to carve these characters below and please let me know what you think of my tutorial or give it a happy thumbs up. Ahh thank you hunny so sweet of you. Yes they really are looking more and more like identical twins as MM gets taller. I think as they get older where the height isn’t a big factor like at 5/6 years old they really will look like twins. Everyone already asks me that. Love it. Ps: Sorry for the grammatical errors, my phone loves to autocorrect me and I pushed post comment prematurely! Creating family traditions has to be one of the nicest thing about having kids. Giving them all this pleasure and excitement. My toddler is 2 and 3 months and it’s only this year that he gets excited about things like his birthday and the upcoming Halloween. We’ve made some Halloween crafts and have pumpkin ready to carve so we’re all getting into the mood. I’m not sure we’ll do actual trick or treating. On the one hand I think he’s too young and on the other we avoid sweets. I have never really done the pumpkin carving thing. Well, I have done it but it certainly not a tradition. I’m not sure about this year…. I remember at uni one year though, a friend decided to carve out a turnip (swede) as she didn’t have a pumpkin. She put a candle in it and absolutely stunk the place out lol! Not a good idea! Thanks for hosting. 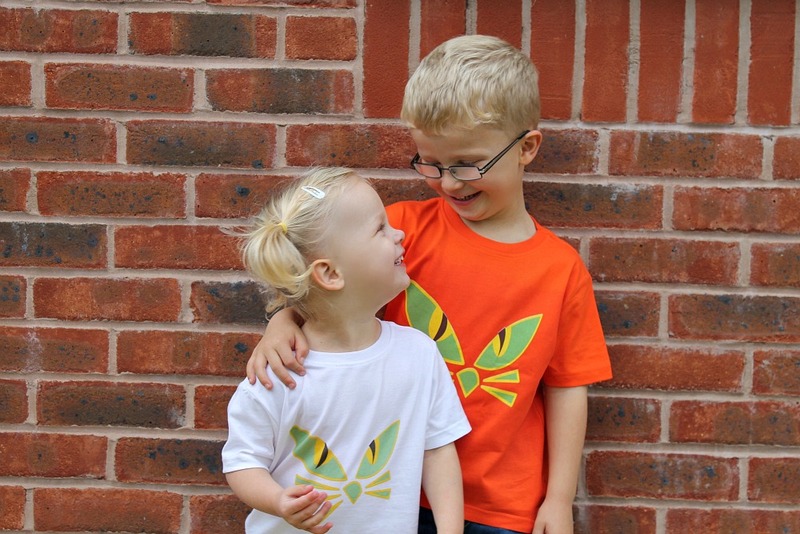 What a lovely idea to have special T-shirts as part of the fun! I love family traditions like this! Memories in the making!! Oh I love your minion! I tried Darth Vader one year which quite frankly was a waste of time! Hi! My son is on holiday next week so I have promised him we will do some pumpkin carving and painting together and he´s so excited. Our tradition is a Halloween party we´ve done every year since Oliver was born. We decorate the house together and he chooses friends and their families to come over and celebrate the 31st with us! I hope our pumpkins turn out as good as yours! What a lovely Halloween tradition. I can’t wait until my two are a little older and we can do parties for it too. I love it. Happy Halloween. It’s never too late to try my tactic it’s easy and fast. I promise. We carved ours a little too early this year but it was so much fun. Thank you so much Becky, so sweet of you to say. We love good family traditions. We had so much fun this year as the kids get older they get more involved. Thank you so much. I needed something to make it easier and help as I can’t draw. This did the trick. Thank you, B is getting more challenging with his request each year. Good thing I have a trick or two up my sleeve for them. I love your tradition! I just started this pumpkin picking/carving with my daughter last year and we hope to continue it as she grows older as well. Love your tutorial. We’ll definitely be using the dot method to make it carving next year. Thanks so much for sharing, Jenny & for hosting us on #sharewithme this week! Love the idea of the t-shirts and the family tradition. I am thinking that we should do that with our family – thanks for the suggestion. Also we are carving our pumpkins this weekend and always resorted to the “typical” carving but what an easy way to carve different characters. I always wondered how others had done it and thought they were just more artistic than I was. Thanks for the tutorial – looks fairly straight forward and I’m definitely going to try it this weekend with my little one. She would love having her favourite princess on the pumpkin she picked out! It’s never too late to start a family tradition and let the festivities begin. It’s such an easy way to carve them I hope you will try something challenging this year too. I am NO artistic what so ever, I can’t draw a stick person. lol I hope you tag me in a photo on social media so I can see what you made. It’s fun as they get older and slowly start to understand each holiday and get invovled with it. We are still board line with MM but B is hilarious now on holidays.Thank you so much we had fun with them this year. Yes it really is a big deal back home. I am a total scaredy cat so I don’t like the scary costumes and the spookiness but the festivities leading up to it and a good halloween party I am in. Sounds like a great time! I love family traditions as well…and we LOVE Halloween in this house!! Thank you so much we love a good family tradition. I need to get more decorations this year for the house. Happy Halloween. Those pumpkins are amazing Jenny! We haven’t done too much yet this year, we’ve got a lot of work going on at the house, so we can’t decorate the outside, and the knock on is of course chaos on the inside too… so I’m whatever the ‘bah humbug’ is for Halloween right now 🙂 I will find the kids Halloween t-shirts though! Ahhh it was a fun challenge and glad they came out. The kids were so excited for them showing anyone that would come over. Too cute. Enjoy it however it comes out darling. Decorate the boxes hahaha Happy Halloween. Oh I think I will be the very same and buy pumpkins and carving them when my kids move out. Too much fun. I am a true kid at heart. Halloween is absolutely my favorite holiday. And I feel the same about sharing and creating traditions with your family and getting everyone into the holiday spirit. We have been lucky so far with a warm fall and have been spending lots of time outside and on hikes with amazing views of the fall foliage. This is also the first year my 16 month old daughter will trick-or-treat which is super exciting (for me.. she will probably care less.. haha). We will just take her to a few neighbors homes and then eat all of her candy! Ahh that is great hunny. Glad you love it and traditions of holidays too. makes everything seem such a bigger deal then and more fun. Ahh thank you darling. It really is taking off I am loving it as the kids get older and older too. Thanks Helena, it really is so much fun to do each year. We love it. Good challenge too. Sounds like a great event hope it comes back next year for you all. Thank you so much Cheryl. It’s all just starting traditions now as they are still so young but working our way to bigger things now. It’s tough so I always plan far ahead. Or I am the same no time. Halloween isn’t the biggest deal in Scotland but this is the second year we’ve been invited to a party. I’m super excited as my son was born on Harry Potter’s birthday – so that basically has to forever be my theme. So he’s baby Harry this year, I have toddler Hermione and then death eater 10 year old! I was tempted to make an owl costume but then discovered Harry Potter onesies! Love the carved pumpkins and the t-shirts. We’ve got no Halloween traditions as we don’t really bother with it as a holiday. But we have loads for Christmas and Easter. Have fun trick or treating! Oh it’s never too late to make a tradition for anything. Go for it. Happy Halloween lovely. Oh yes, I read each book from the first moment they came out way before the hype and the movies were even thought of. hahaha How sad am I? Glad it’s a bonus for you. Oh yes I let the kids do the guts and I do the rest at the time being too young. lol Thank you for your lovely comment darling. Thank you so much. They were so fun to make. It’s great to have traditions for each holiday. Oh that is amazing you can make their costumes it’s one talented I don’t poses sadly. Can’t beat a good harry potter tshirt. Oh yes there are a punch now popping up at local farms. Have a google around in your area. Thank you so much. Shame you don’t get to do it this year. Just do more next year to make up for it. Have a fun half term. Oh Katie you give me way too much credit this is easy. Anyone could do it with my tricks. Last year we carved a pumpkin for the first time and I loved it. But I managed to break the kiddycutter knife that was brilliant at cutting it, and I’ve not got round to buying a new carving set. I guess we’ll be buying a small pumpkin or 2 and maybe trying something more complicated (or just painting them!). It does confuse me calling halloween a holiday, because we don’t have one, it’s a normal day. Oh I usually just use a steak knife unless kids get involved than the kits are a must. lol You don’t have halloween oh no… it’s my fave holiday bless you. Thank you so much darling. We love carving pumpkins and making a big fuss over them and our yearly halloween traditions. Oh you should make your own little traditions so fun. Thank you Steph they were so fun to make this year. It’s so easy you could go get a pumpkin today and have it done in no time. 🙂 Good luck. Oh yes the Olaf and Doc McStuffins thank you so much. We love a good pumpkin carving challenge. Wow they look awesome, my kids go wild for anything to do with minions, just wondering if there’s something I could carve, similar to this, to display in my shop, but for a “all-year-round” decoration?